At 8am I phoned our Home Care Service provider to report the problems we had with the electricity cutting out when we had the grill on - strangely always at Sunday lunchtime when I was grilling bacon for sandwiches. I was quickly given an appointment and our usual friendly electrician was here by 9.30am to identify we needed a new element and he would be back Wednesday to fit it, but warned the fault it could happen again in the meantime . I could not ask for better service than that! Teatime and using the grill - it happened again, all electricity off, N quickly sorted the trip meter. But then we discovered we had lost our Sky TV connection - we tried the usual attempts to disconnect, wait and try again but it still did not respond. So a phone call to Sky Protect. What a palaver, trying to get through the endless automated messages, menu options, the security questions, (there seemed to be a problem with my mother's maiden name - was I sure I had it right? ); being put on hold to loud music for a long time, having difficulty with the advisor's accent. Frazzle and Frustration - I was a nervous wreck! Yet at no time was I asked for our Sky Protect policy no, which i had to hand. Anyway I eventually got an engineer's visit arranged. Then guess what? We tried the TV about 3 hours later and we got a fine picture. 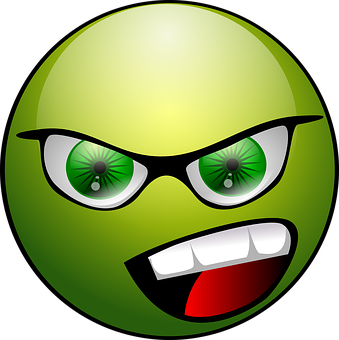 so of course I had to gt through the whole rigmarole of the phone call again to cancel the engineer's appointment! On a happier note - there was news of the royal baby and we enjoyed the final of University Challenge on TV. Otherwise the usual weekly routine of domestic tasks, gardening - I got the grass cut, before some downpours, went to the Monday movement class, Melrose Library, and the Thursday walk around Mill Meadow. and prepared for going away on Friday. We made great use of our free bus pass to travel to Perth where N. had a meeting followed by a formal meal. 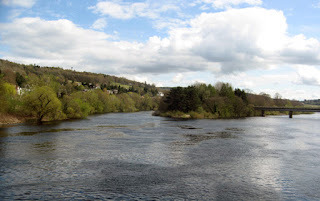 I was not going to miss the chance of a weekend break away, with a good hotel,overlooking the River Tay, with an attentive young staff and lovely meals. I ate too much, but took some walks along the river and made the most of being near High Street shops. Apart from one torrential downpour, the weather was sunny and we even managed a picnic lunch (courtesy of Marks and Spencers), sitting by the river. 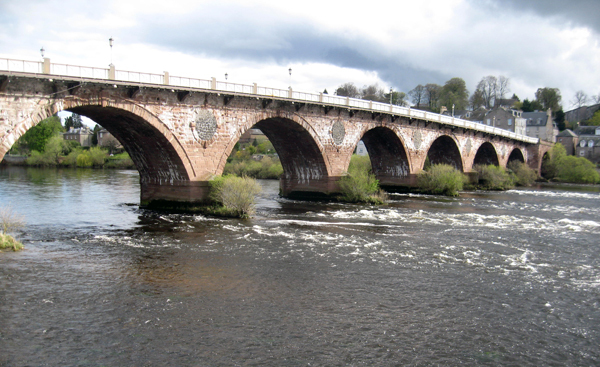 Perth Bridge over the River Tay - the view from our hotel bedroom. 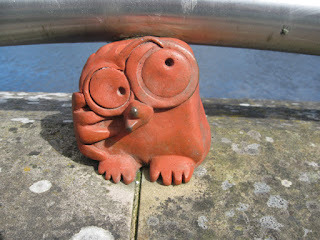 One of many little fun carvings along the the river bank. Of course, I had to put my "tourism hat" on, so called into the local tourist information centre (now known as an "I" Centre) for a city map. The assistant was very welcoming and friendly - in a uniform new to me - a bright heather-pink long sleeved top and over it a shorter grey T shirt. "i Know - Let Me Inspire You!" We had quite a laugh abut that slogan and the comments it received from some wits. 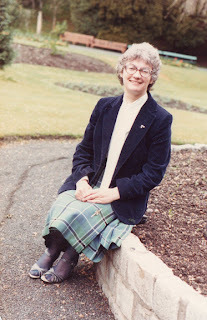 I would want to cover it up, if I was dashing out to the shops at lunchtime. .
What a contrast to the staid formal uniform of my day - though I was proud of my Douglas tartan kilt, and it helped that then (late 1980's) kilts were a fashion item. Plus the fact the staff were generally part-time, seasonal and from an older age-range - many of us would look like mutton dressed as lamb in today''s casual style - and no tartan in sight! I am glad I worked in earlier times in a uniform that made me feel smart and professional. Coming to my mind during our stay, was the poem by William McGonigall on the "Silvery Tay". William Topaz McGonagall, (1825-1902) was a self-educated, hand loom weaver of Irish descent, who became a poet and tragedian of Dundee, penning over 200 poems. But his fame rested on hm being widely hailed as writer of the worst poetry in the English language. The verse above is typical of his style!